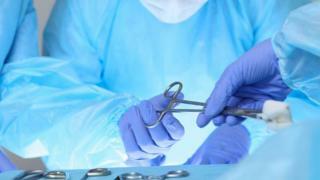 The chief medical officer is to write to health trusts calling for a halt to the use of surgical mesh for urinary incontinence in Northern Ireland. Dr Michael McBride is "advising that a pause in mesh surgery be introduced". The announcement comes after NHS England said it was putting an immediate curb on operations after safety concerns. It accepted the advice of a new review looking at harm reported by women who received the treatment. The campaign group Mesh Ireland said: "The mesh injured do not benefit from today's news; they take comfort that injury to more unwitting women has been prevented. "Stopping the next cohort of mesh injured is the right thing to do. Now an action plan must be put in place for the twenty-year legacy of those injured by the "quick fix" mesh tapes." In February 2018, Health Secretary Jeremy Hunt announced the Independent Medicines and Medical Devices Safety Review in the House of Commons. Mr Hunt said it would examine how the healthcare system had responded to concerns raised by patients on three issues - including surgical mesh. Baroness Julia Cumberlege, who chaired the review, said she had been "appalled at the seriousness and scale of the tragic stories that women and families" including some from Northern Ireland had recounted. As a result, the review team said they felt a pause to the procedure was necessary until a set of conditions to mitigate the risks of injury are met. That is expected to take place in March next year. In 2014 the Scottish government put in place a suspension in the use of mesh for stress urinary incontinence. Last year, BBC News NI revealed that some women in Northern Ireland were left 'physically and mentally scarred' after having mesh implants. A spokesperson for the Department of Health in Northern Ireland said: "The chief medical officer Dr Michael McBride will be writing to trusts advising that a pause in mesh surgery be introduced similar to that being put in place in England."